Despite claims of scaling back settlement activities, Israel plans to build housing units, a swimming pool, mini country club, community library, parking spaces, a synagogue and kindergartens in Al-Quds (occupied East Jerusalem). "We are talking about a massive expansion of an existing settlement in the Ras al-Amud neighborhood into a settlement of more than 1,000 in the heart of a crowded Palestinian neighborhood in the eastern part of the city," Yehudit Oppenheimer, director of the Ir Amim group, told Yediot Aharonot on Sunday, 23 August. "This is a very sensitive place, and this settlement is a continuation of the 'Hebronization' process in Jerusalem, which damages the chances for a future agreement." The plans, submitted for the Jerusalem municipality for approval, include the construction of 104 housing units in Ras Al-Mud neighborhood, home to some 14,000 Palestinians. They also involve high-end housing and a swimming pool, mini country club, community library and parking spaces. A synagogue, kindergartens and a Jewish ritual purification bath are also planned for construction there. The new units would also be connected to another settlement called Ma'aleh Zeitim to form the largest Israeli settlement in Al-Quds. "This is a blatant provocation against Israel's relations with the Palestinians, and has a very dangerous potential," warned Oppenheimer. Israel occupied Al-Quds in the 1967 Middle East war and then annexed the city in a move not recognized by the world community or UN resolutions. 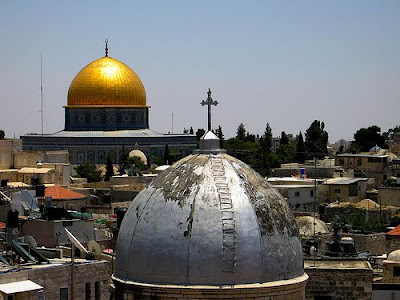 The holy city is home to Al-Haram Al-Sharif, which includes Islam's third holiest shrine Al-Aqsa Mosque, and represents the heart of the Arab-Israeli conflict. Palestinians insist the holy city will be the capital of their future independent. The Peace Now group said Sunday that settlement activities in the occupied Palestinian territories were continuing unabated. "In the last six months settlers had no reason to complain," Peace Now Secretary-General Yariv Oppenheimer told Yediot Aharonot. In its bi-annual report, the advocacy group said almost 600 units have been constructed in the West Bank since the start of the year. It also cited an 8-percent increase in the number of permanent structures currently under construction. "The construction continues with government support in the large settlement blocs and in a roundabout manner in isolated colonies." The advocacy group said that in some cases construction is done based on old plans that have not been approved or even without any plans at all. "By using old blueprints they continue to expand settlements throughout the West Bank without the government's intervention, even when this is done illegally," he added. "The number of new structures and caravans speaks for itself." Peace Now accused the Israeli government of turning a blind eye to all these activities. "It is in the power of the government to prevent construction that has been green-lighted in the past, but politically it finds it easier to allow the construction by turning a blind eye and providing direct or indirect incentives, while at the same time continuing to maintain that it is pushing for a 'settlement freeze'." Israeli Prime Minister Benjamin Netanyahu has rejected American calls for a total freeze. About half a million Jewish settlers currently live in settlements in both the occupied West Bank and Al-Quds. On 2 August 2009, after cordoning off part of the Arab neighborhood of Sheikh Jarrah in east Jerusalem, Israeli police evicted two Palestinian families (more than 50 people) from their homes; Jewish settlers immediately moved into the emptied houses. Although Israeli police cited a ruling by the country's supreme court, the evicted Arab families had been living there for more than 50 years. The event – which, rather exceptionally, did attract the attention of the world media – is part of a much larger and mostly ignored ongoing process. The conclusion is obvious: while paying lip-service to the two-state solution, Israel is busy creating a situation on the ground that will render such a solution impossible. The dream underlying Israel's plans is encapsulated by a wall that separates a settler's town from the Palestinian town on a nearby West Bank hill. The Israeli side of the wall is painted with the image of the countryside beyond the wall – but without the Palestinian town, depicting just nature, grass and trees. Is this not ethnic cleansing at its purest, imagining the outside beyond the wall as empty, virginal and waiting to be settled? On the very day that reports of the government's 70,000-home plan emerged, Hillary Clinton criticised the rocket fire from Gaza as "cynical", claiming: "There is no doubt that any nation, including Israel, cannot stand idly by while its territory and people are subjected to rocket attacks." But should the Palestinians stand idly while the West Bank land is taken from them day by day? When peace-loving Israeli liberals present their conflict with Palestinians in neutral, symmetrical terms – admitting that there are extremists on both sides who reject peace – one should ask a simple question: what goes on in the Middle East when nothing is happening there at the direct politico-military level (ie, when there are no tensions, attacks or negotiations)? What goes on is the slow work of taking the land from the Palestinians on the West Bank: the gradual strangling of the Palestinian economy, the parcelling up of their land, the building of new settlements, the pressure on Palestinian farmers to make them abandon their land (which goes from crop-burning and religious desecration to targeted killings) – all this supported by a Kafkaesque network of legal regulations. Saree Makdisi, in Palestine Inside Out: An Everyday Occupation, describes how, although the Israeli occupation of the West Bank is ultimately enforced by the armed forces, it is an "occupation by bureaucracy": it works primarily through application forms, title deeds, residency papers and other permits. It is this micro-management of the daily life that does the job of securing slow but steady Israeli expansion: one has to ask for a permit in order to leave with one's family, to farm one's own land, to dig a well, or to go to work, to school, or to hospital. One by one, Palestinians born in Jerusalem are thus stripped of the right to live there, prevented from earning a living, denied housing permits, etc. Palestinians often use the problematic cliche of the Gaza strip as "the greatest concentration camp in the world". However, in the past year, this designation has come dangerously close to truth. This is the fundamental reality that makes all abstract "prayers for peace" obscene and hypocritical. The state of Israel is clearly engaged in a slow, invisible process, ignored by the media; one day, the world will awake and discover that there is no more Palestinian West Bank, that the land is Palestinian-free, and that we must accept the fact. The map of the Palestinian West Bank already looks like a fragmented archipelago. In the last months of 2008, when the attacks of illegal West Bank settlers on Palestinian farmers became a regular daily occurrence, the state of Israel tried to contain these excesses (the supreme court ordered the evacuation of some settlements) but, as many observers have noted, such measures are half-hearted, countered by the long-term politics of Israel, which violates the international treaties it has signed. The response of the illegal settlers to the Israeli authorities is "We are doing the same thing as you, just more openly, so what right do you have to condemn us?" And the state's reply is basically "Bde patient, and don't rush too much. We are doing what you want, just in a more moderate and acceptable way." The same story has been repeated since 1949: Israel accepts the peace conditions proposed by the international community, counting on the fact that the peace plan will not work. The illegal settlers sometimes sound like Brunhilde from the last act of Wagner's Walküre – reproaching Wotan and saying that, by counteracting his explicit order and protecting Siegmund, she was only realising Wotan's own true desire, which he was forced to renounce under external pressure. In the same way the settlers know they are realising their own state's true desire. While condemning the violent excesses of "illegal" settlements, the state of Israel promotes new "legal" building on the West Bank, and continues to strangle the Palestinian economy. A look at the changing map of East Jerusalem, where the Palestinians are gradually encircled and their living area sliced, tells it all. The condemnation of anti-Palestinian violence not carried out by the state blurs the true problem of state violence; the condemnation of illegal settlements blurs the illegality of the legal ones. Therein resides the two-facedness of the much-praised non-biased "honesty" of the Israeli supreme court: by occasionally passing judgment in favour of the dispossessed Palestinians, proclaiming their eviction illegal, it guarantees the legality of the remaining majority of cases. Taking all this into account in no way implies sympathy for inexcusable terrorist acts. On the contrary, it provides the only ground from which one can condemn the terrorist attacks without hypocrisy. The shrapnel holes in the wall behind her underline why Subheya Motawe, her husband and their 15 children were forced to escape from their four-room home in this central Gaza village last January. With no time to grab most of their possessions, Mrs Motawe, 52, had the presence of mind to at least take the most valuable one before fleeing: a pregnant female rabbit. After the family returned home at the end of the Israeli military's assault on Gaza, the doe gave birth to a healthy litter. Which was just as well since most of the family's other 24 rabbits were casualties of Operation Cast Lead – either directly because of bombardment or indirectly because Mrs Motawe hadn't been able to leave the house to get feed or clean water for them. With the new offspring, Mrs Motawe had the nucleus she needed to make a fresh start. For rabbits have become an unlikely siege-beating lifeline for some of the poorest families in Gaza. Relatively cheap to feed and famously reproductive, the fluffy creatures are helping families like the Motawes to survive the desperate shortage of income – and nutritious food – imposed by the economic collapse of a Gaza under blockade. A "steadily rising trend" of chronic malnutrition in Gaza since the beginning of the Israeli blockade imposed when Hamas seized full control of the territory in June 2007, was revealed in a report by the International Red Cross and Red Crescent in November. It pointed to an unhealthy shift towards "low cost, high energy" foods such as cereals, sugar and oil at the expense of dearer but more nutritious foods such as meat, fish, cheese, fruit and vegetables. It was in this context that Care International began a pilot scheme to supply 70 "vulnerable" families with two hutches, four months' worth of feed and-at the ratio regarded by experts as optimal for breeding – four females and one male rabbit apiece. Mrs Motawe says she was "excited" to be among the first to benefit. Having been faced with debts and potentially crippling education costs for such a large household, she says: "It is a good way to provide income for the family." Rabbits breed quickly and repeatedly – a single female can give multiple births up to six times a year. Mrs Motawe: "I like feeding them and caring for the soft little babies. Rabbits are so quiet and calm, when I come early in the morning to water them and clean the cages. No bad smell." Read more about History of Jerusalem here.